Craig Smith is Chairman of Swiss America located in Phoenix, AZ. Craig has authored three popular books over the last decade: Crashing the Dollar: How to Survive a Global Currency Collapse (2010), Black Gold Stranglehold: The Myth of Scarcity and the Politics of Oil (2005) and Rediscovering Gold in the 21st Century: The Complete Guide to the Next Gold Rush (2001). Contact Bronwin Barilla to schedule media interviews. The Most Seductive Four-Letter Word on Earth -- By Craig R. Smith - Promises, promises. Each passing day seems to bring yet another outlandish promise from yet another 2020 presidential candidate - usually laced with that magical, seductive four-letter word: FREE. 10 Reasons to Double-Up on Gold in 2019 -- A Special Alert From Craig R. Smith, Swiss America Chairman - 2019 represents a golden opportunity to double-up on your precious metals holdings for many fundamental reasons. Perhaps the most obvious reason is that gold has been the single best performing asset since the beginning of the 21st century, with an average return of 19.73%. 2019: What Could Go Wrong? -- By Craig R. Smith - If you thought the U.S. stock market correction of 5% to 9% in October was bad, ‘you ain't seen nothing yet’; according to a growing choir of leading economic voices. The more you IRA... the less you IRS! -- By Craig R. Smith - When it comes to saving for retirement, slow and steady always wins. Socking away money into a qualified, tax-deferred retirement account is the secret to creating a sizable nest egg. Red October! Is This Wall Street’s Big Correction? -- By Craig R. Smith, Chairman, Swiss America - Today the DJIA fell 831 points (3.1%), lead by the NASDAQ'S 400 point drop, as rising rate fears caused investors to quickly pivot out of technology stocks. An Inflation Nightmare in Socialist Venezuela -- By Craig R. Smith - According to the International Monetary Fund, Venezuela's inflation will skyrocket to one million percent by the end of the year as the government continues to print money. The Day That Changed America's Future -- By Craig R. Smith- On March 23, 2018, unbeknownst to most Americans, the course of U.S. history was forever changed by irresponsible government leaders from both parties. On that fateful day, the massive $1.3 trillion, 2,232-page omnibus spending bill (which no one even took the time to read) tossed financial sanity out the window. 2018: Year of the Bubble? -- By Craig R. Smith- Today a growing number of highly respected business leaders, such as Bill Gates and BlackRock CEO Larry Fink, are recommending urgent preparation for a major drop in the U.S. stock indexes. In March, Bank of America analysts warned that 13 of 19 Bear Market indicators for stocks have now been triggered. WHAT NOW? 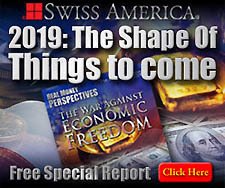 -- By Craig R. Smith, Chairman, Swiss America - We seem to live in a very upside down world to say the least and it’s quickly spinning out of control. World politics and economics are so removed from any sense of normalcy that the average person is holding their breath and wincing at the future. Geopolitically and economically we are one headline away from a serious moment in history. FROM THE DESK OF THE CHAIRMAN: April 7, 2017 -- While the details are still very much in flux one thing is certain, President Trump's resolve in asserting America as a force against human atrocities; a resolve absent during the Obama years. Trump Prepares to “Do a Number” on Dodd-Frank Banking Laws -- By Craig R. Smith- While many in the media lament President Trump's campaign promise to “do a number” on the Dodd-Frank legislation passed after the 2008 financial crisis, not much will happen until the 120 day review has passed and the data is reviewed by the president. The Gold Bull is Back! -- By Craig R. Smith--Precious metal prices started off 2017 with a bang, amid robust safe-haven buying and falling U.S. dollar. In January, gold prices rose over 5% and silver prices rushed up over 10%. Are You Prepared For America's Next 100 Days? -- By Craig R. Smith - Political administrations change regularly, however, government behavior rarely changes quickly enough to surprise the money world. GOLD’S RISING ROLE IN A GLOBAL ECONOMY -- By Craig R. Smith, Chairman, Swiss America - When it comes to a means of trade and exchange, it seems that the world has come full circle. In ancient times men bartered with grain and livestock as a method of payment. DON'T BANK ON YELLEN'S FED -- By Craig R. Smith, Author/Chairman, Swiss America - After listening to Fed Chairman Janet Yellen's statement justifying the increase in interest rates for the first time in nearly a decade, I am convinced her ability to contradict herself rivals that of President Barack Obama. Will The New EU Strategy Backfire? -- By Craig R. Smith, 6.6.14-- Today Europe joined America in abandoning austerity by lowering interest rates to below zero. This move forces depositors to withdraw assets from banks and move them into assets with more growth potential; such as stocks, real estate or commodities such as gold. U.S Citizens Must Take Bold Action -- By Craig R. Smith, 3.4.14 - There is a great deal of similarity between what is going on today and what happened 35 years ago that is very important to consider. In 1979, several events simultaneously occurred that had a profound impact on the markets as well as world history. Urgent Memo from Our Chairman -- By Craig R. Smith, 1.29.14 - Imagine waking up one morning to find your bank locked and access to your money via ATM denied. Your ability to pay bills or buy food – and your boss's ability to pay you – all gone in an instant, without warning. If your bank accounts and credit cards were suddenly out of reach for days, for months, or forever, what would you do? Americans the Real Losers -- By Craig R. Smith, 10.20.13 - The latest crisis in D.C. was just the opening act in the unfortunate last chapter of Obama's America, one that will have a very tragic end for all hard-working Americans. Stop the Debt Ceiling Scare Tactics -- By Craig R. Smith, 10.11.13- To quote the famous Yogi Berra, “it's like déjà vu all over again” with the battle over ceremonially raising the debt ceiling. According to the elected officials of our great nation, we must saddle our children and grandchildren with another couple trillion dollars of debt in order to protect them. This logic seems flawed. Fed Plans to Sacrifice the Dollar -- By Craig R. Smith, Chairman, Swiss America- 7.15.13-- Last week our Fed Chairman admitted he is willing to sacrifice the U.S. dollar in order to "save the economy". Fed Chairman Ben Bernanke called for maintaining accommodation, saying, "highly accommodative monetary policy for the foreseeable future is what's needed in the U.S. economy," reports Bloomberg. Gold Still the Buy of a Generation! -- By Craig R. Smith - 4.18.13--Although we live in an era of instant information and communication; true wisdom, perspective and insight have never been more scarce. Recent gold news headlines again declaring gold is "dead" ranged from absurd to laughable to downright foolish. 2013: Doomed To Repeat History? -- Investors should never forget the lessons of the 2008 financial meltdown. But have they already? Who can forget the anguish of watching the U.S. Fed and Treasury stretching the limits of fiat money creation (and laws of economic gravity) by throwing $1 trillion dollars at the 2008 banking crisis and the failure of Lehman Brothers, a Wall Street giant? 2013 Budget 'Deal': If Pigs Could Fly -- 1. FISCAL CLIFF 'DEAL' IS NOT A FIX - This agreement has no cuts, no growth, no jobs and $330B in new spending. 77.1% of Americans will be burdened with a tax increase as the Bush-era two-year moratorium on payroll taxes expired, causing Social Security taxes to effectively rise 2% across the board. For the average family earning $50k per year that equates to at least a $1,000 increase in taxes, in direct violation of Obama's repeated promise to only tax those earning over $250k/year. Gold: 2013 'Fiscal Cliff' Safety Net -- by Craig R. Smith-11.12.12- The future of gold will be bright - whether we are pushed off the 2013 fiscal cliff or not. If we tumble off the 2013 fiscal cliff; taxes will go up, spending will be slashed and we will cut the 2013 deficit by $600 billion. Why All Roads Now Lead To Inflation -- By Craig R. Smith-10.1.12--Like the citizens of Wiemar, Germany nine decades ago, most Americans today simply fail to notice the connection (and consequences) of creating vast quantities of money which always leads to debasement. Bernanke Fails to Inspire Investors -- Craig R. Smith--6.20.12--Wall Street yawned at the latest Fed policy statement because it was just more of the same failed policies of the past. Interest rates will remain at 0 - 0.25% until late 2014, Operation "Twist" (scheduled to end in June) will continue until year end - to the tune of another $267 billion piled onto the Fed balance sheet. BREAD LINE OR BUFFET LINE? -- Craig R. Smith, 5.21.12--Which is the wise currency to be holding today to maintain your standard of living in the future? Confidence is key in maintaining the store of value of every paper currency on earth. Gold is the only form of currency that doesn't require confidence because it is universally accepted as a reliable store of value and a global monetary unit. From the desk of Craig R Smith -- By Craig Smith, 5.11.12-- On many recent radio interviews I have shared my opinion that the banks in America are in worse shape today than they were in 2008. I've pointed out that nothing changed after the painful lessons of just how much damage speculative trading, in an attempt to boost profits, can do to destroy bank capital. GOLD vs. VOODOO ECONOMICS -- By Craig R. Smith, 3.21.12--While watching the testimony of U.S. Treasury Secretary Geithner and Fed Chairman Bernanke, I was struck by several answers provided by the witnesses. One answer stood out amongst them all.